Rubber Water Discharge Hose is a versatile rubber discharge hose construction offered in 2-ply and 4-ply textile reinforcement. 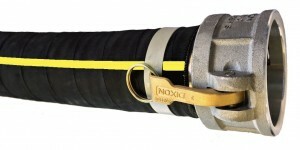 This hose is suitable for medium and heavy duty discharge applications where durability and longevity are of benefit. Offered in a wide range of sizes, the 2 and 4 ply options allow options in pressure and weight. An excellent hose for long term installations, it is also available in oil resistant rubber, Type 6802. Can be custom manufactured up to 24″ ID and to your specifications. Also available by special order: Slip Ring Discharge Hose, a lightweight low-pressure rubber discharge hose with ends that slip into one another without couplings, ideal for large diameters where end couplings can be heavy and expensive.